Aubrey is the son of a prominent politician and a well-respected academic, that’s rather a lot to live up to even if he is brilliant at magic. With his best friend George to keep him company he is asked to attend a royal hunting party as his father’s representative. There they discover a golem – a magical creature fashioned for the express purpose of killing Prince Albert. Aubrey and George foil the attempt and Aubrey is far too curious to let others do all the investigating. He can sense the storm that is coming, both political and magical, and he won’t be kept from being involved, especially if others try to keep him out of it. I must admit to reading this book on the strength of its first two sentences – ‘Aubrey Fitzwilliam hated being dead. It made things much harder than they needed to be.’ And the book didn’t disappoint. 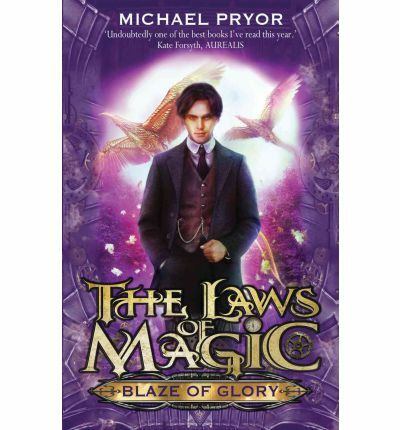 This is the first of The Laws of Magic series and is a wonderful steampunk novel that weaves politics and magic seemlessly. Another standout feature for me, are the very stong female characters who stand very solidly on their own two feet alongside the male ones. Caroline is one of my favourite YA characters.